I have a friend that is trying to learn 120 things in 20 years. Well, one of those internet friends whom I will never meet in real life. He mentioned that he was thinking about learning Leatherworking as a thing so I thought I would give a primer on the subject. Not that I am an expert or anything. Sometimes starting is the hardest part, and not knowing what to start with is a lot of the reason to not start. My half done leather messenger bag. A good intro into all the words used in leatherworking can be found at https://www.tandyleather.com/en/leather-buying-guide.html. Leather is sold by weight. Weight per square foot in ounces. The thicker the leather, the heavier the leather, the larger the number. There are charts out there there that will approximate the weight to the thickness to the scale of 1 oz equals 1/64th of an inch. Or thereabouts. Thicker leather is used for different things than thinner leather. Next time you have something made out of leather, feel the thickness of the leather. Think about why that thickness of leather was used. There are different ways they make leather – chrome tanned or veg tanned. This is different ways that it is made, different chemistry. I would imagine that there are different strengths and weaknesses for each type, but I don’t know the details. I get whatever is cheapest at the time. 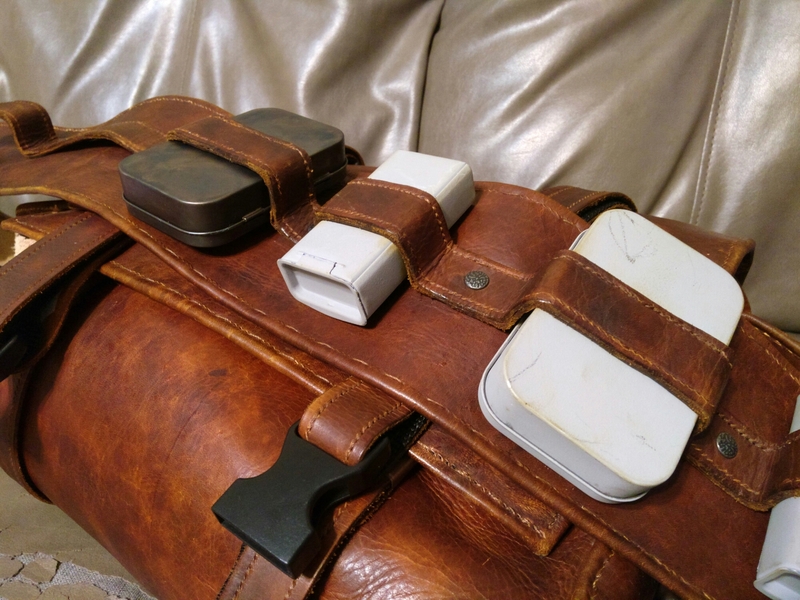 Once you find your leather, you will also need a few things to get started. A cut thing, a stitch thing, likely a few hole things, marking things, and possibly a hit thing. Cut things are pretty important. I see a lot of videos where people use a disposable razor knife, which seems to work well. They sell expensive half circle knives, which look like they work really well. I’ve made one, but have yet to try it on leather. I use a rotary cutter and like it. Stitch things are really important. I use two types of needles. Harness Needles and Glovers Needles. Harness needles are not really sharp and are good for going through existing holes. They tend to be used two at a time, one on each end of the thread. You end up making a stitch that looks like a sewing machine stitch, but is much better. The stitches this way don’t unravel easily if cut like from a machine. Glovers needles are wicked sharp and are used on thinner leather like it is cloth. The two threads I’ve tried are the waxed thread and artificial senew. I like the waxed thread better. There are lots of ways to make holes. The hole things are the second expensive thing to buy, after the leather. You can use them to make little holes to stitch in and you can make not so little but still small holes to put rivets and snaps into. The simplest hole tool is the awl. This makes small holes. I’ve found that some awls are better than others. Long, thin, well tapered and smoothed awls like a needle work better than cheaper awls with a simple angled ground tip like a nail. I’ve not tried making one yet, but I have a few broken drill bits I may give a try to grind. You can get round hole punches which are handy. The kind that looks like a punch and needs a mallet is fussy to use, but can be used to make holes that aren’t near an edge of the leather. The type that looks like a pinwheel crossed with a paper punch is easier to use, but only works near the edges of the leather. My favorite hole tool is the stitching punches. These are the most expensive, but singularly made my work look better. I didn’t skimp on these, getting the nicer set available at the store. Getting nice even stitches is a huge improvement on the niceness of the finished product. Mark things help layout and measuring and stuff. I find ball point pens work well. In woodworking, they say if you want to make a line, use a pencil, if you want a fine line, use a sharp pencil, if you want a perfect cut, use a knife. I do a lot of marking with my knife, but I prefer using an awl – it leaves a good mark but doesn’t cut the surface weakening the leather. I picked up a cheap divider (looks like the old geometry class compass) and use it for marking stitch lines along the edges of the leather. This trick with the stitching punches is what made my work go from a total hack job to not bad. I use a simple stick as my hit thing. Why buy something that I found in my yard? A stick found in the yard works as a mallet. I’ve done a bit of reading, and a lot of youtube watching to learn how to do a bit of leatherworking. It’s hard at first to sort out who knows what they are talking about and who’s not any better than I am. Once you find a good youtube author, give ’em a subscribe so you can keep getting more of the better videos. Years ago I had dubbed my rubber mallet "sudo !!"